Have You Heard About The Florida Veterans Walk Of Honor? The Veterans Walk of Honor is a permanent tribute to the men and women who have served in the Armed Forces of the United States. It provides an opportunity for family members and friends to thank a Veteran in their life with a long-lasting dedication to the Veteran's service. The heart of the Veterans Walk of Honor will consist of engraved bricks which are being offered to veterans, families and friends of veterans. The proceeds from the sale of the engraved bricks will go to the Florida Veterans Foundation, the Direct Support organization to the Florida Department of Veterans Affairs to help further the Foundation’s mission to Serve, Support and Advocate for our Florida Veterans. These lasting tributes are not limited to service in any specific war or campaign and can encompass any service period, and can be for non-Florida veterans too. 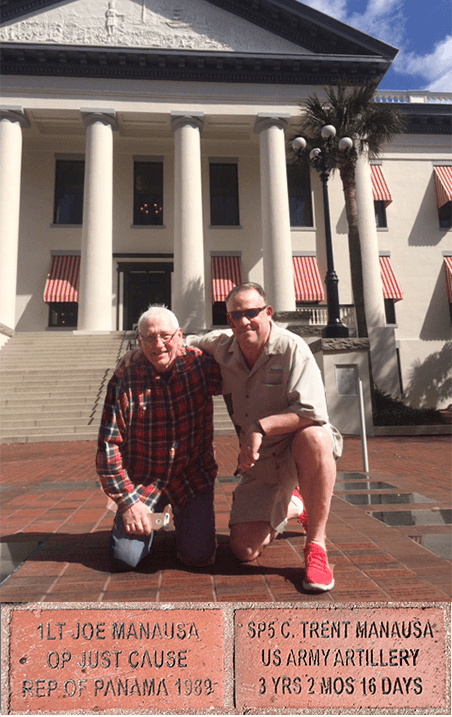 Placed prominently between the old and new Capitol buildings, the House and Senate Buildings and the Florida Veterans Memorial on Florida's Capitol Hill, they will be viewed by tens of thousands of visitors each year. What a great way to do more than just say "thank you for your service" for the veteran in your life. The total scope of the Florida Veterans Walk of Honor includes room for only 25,000 engraved bricks. Considering that there are millions of veterans who live in Florida, it is likely that the project will sell-out fairly soon (or at least I hope it does). There is no special waiting list to receive prominent placement on the Walk of Honor, you merely need to place your order(s) as soon as you can. They are placing bricks on a first come, first served basis, and you can do it right now. To order your brick, click here for the Florida Veterans Walk Of Honor Order Form or click the Walk of Honor Order Form image on the left. Whether you yourself have served in the Armed Forces of the United States or not, you have the chance to provide an enduring "thank you" to somebody in your life who has. I want to encourage you to follow my lead on this one. Purchase a brick (or two) in honor of your Florida Veteran, then take a trip to the Florida Capitol Complex in July to see it for yourself. You'll be saying "thank you" in a manner that your veteran will appreciate and you'll also be helping to fund the Florida Veteran's Foundation. I Watch HGTV, I Know What I’m Doing! Yesterday - many of us were made very proud by the well planned and performed ceremony at the Walk of Honor. Every participant at the event and especially those of us that had our memorial brick implanted at the site appreciate the honor we received in bieng a part of Florida History.